Very rarely does a film come along that parallels exactly what you’re going through in your life. Even rarer is the film that exactly mirrors what you’re experiencing at that precise moment. 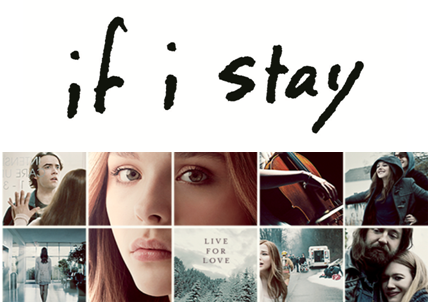 If I Stay is that rare gem. Mia Hall’s (Chloë Grace Moretz) life is pretty above average. She is a very talented cellist, has very encouraging and supportive parents (played by Mireille Enos and Joshua Leonard), a great friend named Kim (Liana Liberato) and an older, hot rocker boyfriend named Adam (Jamie Blackley). Her worries are the typical teenage problems ranging anywhere from vanity issues to eagerly waiting to hear back from colleges she applied to. Suddenly her life is completely changed after a car crash claims the life of her family and leaves her in a deep coma. I am reminded of the ending of Star Wars Episode III: Revenge of the Sith where a pregnant Padmé is having her children and the droid just turns to Obi-Wan and says that she is medically fine, but she has “lost the will to live.” That ridiculous cause of death seems to be the case in If I Stay. Due to either supernatural elements or very realistic coma-induced dreams, Mia is able to see everything that is going on around her. Going past all the flashbacks and hypothetical flashforwards, Mia must decide whether she wants to continue living or if she will decide to die. If the film hadn’t come off as absurd and emotionally forced, it could almost pass as a decent existential story. The film is not without its charms. The cast is easily one of the best (and most believable) aspects in the film. They bring life to this newest lifeless addition to the YA (Young Adult) film adaptation canon. I have to bring special attention to Chloë’s performance, which is really the only reason (if any) to see this film. The other reason would have to be the soundtrack, which I found myself enjoying much more than whatever was actually happening in the film. There was a very rousing rendition of Smashing Pumpkin’s “Today” that felt like the most genuine, emotional moment in the entire film. The film has the uncanny ability to mirror your own experiences while you’re watching it. Instead of keeping your attention, the film too will make you think back on all the choices and decisions that have led you to go and watch the movie. Did you do it for someone you love? After going through all of this in your head, you too will be faced with the tough decision. Do you stay or do you go? If you do end up staying for If I Stay, and you don’t belong to the very young, female demographic these kinds of films target, then you should know you’ll be in for a very long ride with very few shining moments. If for whatever reason you find yourself in your own sleep-like mini-coma, then at least you’ll have a good soundtrack to carry you through the end. Previous ArticleTV Review: HBO's The Leftovers 1X09, "The Garveys at Their Best"